I started writing for Minesota Hockey magazine in 2015. You can find all of my bylines on the Minnesota Hockey Magazine website. As a hockey fan, it was really fun to be able to watch hockey and write about it. A highlight was covering the best high school state tournament in the country: The boys' state high school hockey tournament at the Xcel Energy Center. Andover High School senior goalie Maddie Rooney decided to join the boys' team for her senior season. 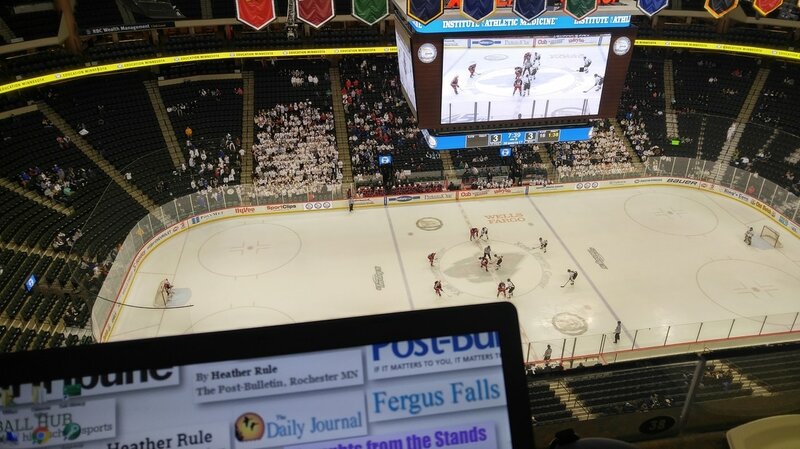 Double overtime, and the winner moved on to the boys' state hockey tournament. What a game. This story was a lot of fun. It was my first Wild game I had the opportunity to cover. I had a blast. Edina is the hockey team everybody loves to hate in Minnesota. The boys' hockey team tried for three titles in a row but was upset by the Duluth East Greyhounds. 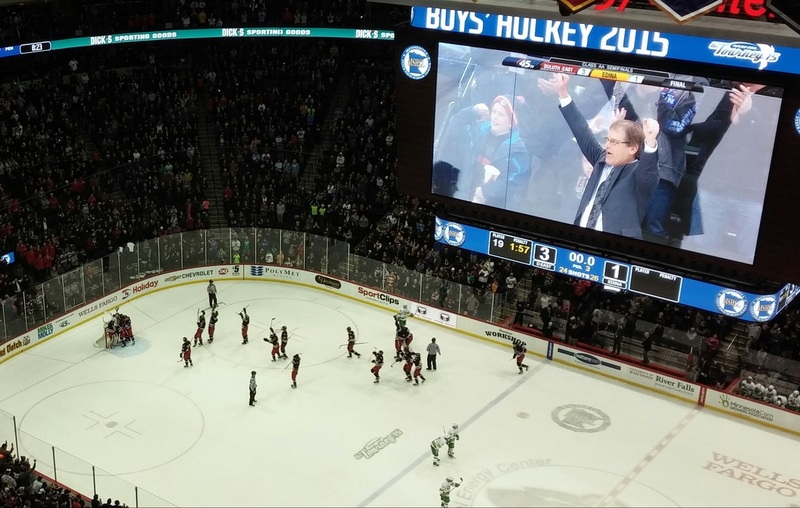 The atmosphere at the Xcel Energy Center was unbelievable for this game. A feature about the record-setting 2015 senior class on the University of Minnesota women's hockey team: Rachel Ramsey, Rachael Bona, Meghan Lorence and Shyler Sletta. No. 18 St. Cloud upset No. 1 North Dakota in the semifinals of the NCHC Frozen Four with a 3-1 win. The tournament was held at the Target Center in Minneapolis. This story was a bit different but fun. Wild players like Ryan Carter and former player Wes Walz participated in a hunt with some lucky Wild fans. Wild player Charlie Coyle had a higlight-reel goal in a victory over the Red Wings. The Wild are struggling to put pucks in the net, with the latest evidence coming in the form of a 1-0 shutout to division-rival Winnipeg. Maple Grove upset the defending Class 2A state girls' hockey champions of Hill-Murray with a 1-0 shutout victory. This game marked interim coach John Torchetti's first loss as commander behind the bench for the Minnesota Wild. This story can be found on pages 64-65 of this special hockey tournament magazine. I talked with Rob McClanahan, former Mounds View High School and 1980 Team USA player, about the Mustangs' run to the high school tournament in '76. Hermantown had no trouble getting past the semifinals of the Class 1A boys' state hockey tournament. The University of Minnesota men's hockey team made it past the semifinals as the No. 1 seed in the Big Ten Tournament. Warroad, Minn. is a true hockey capital of the world. It all starts with the youth - and the unlimited, free ice time.